This will be an ongoing post describing my ordeals as I, a law abiding citizen, attempt to obtain my NJ Firearms Purchaser ID card. 2013-04-23 Attempted to submit a completed New Jersey Firearm Purchaser ID card application to the Jersey City Police Department at 1 Journal Square. Told to come back on a Monday, Wednesday or Friday between 8am and 3:30pm. 2013-04-24 Arrived back at 1 Journal Square at 8am. Told to come back at 8:30am and not even permitted to wait in the lobby because “they don’t want people sitting around out here”. Killed 30 minutes and spoke to the clerk who informed me I had filled out the wrong application. I was given a stapled packet containing a State Application Form, Fingerprinting Scheduling Form, Applicant Questioner Form, Mental Health Record Search Consent Form, Information Sheet, Domestic Violence Disclosure Form and a Authorization Waiver. 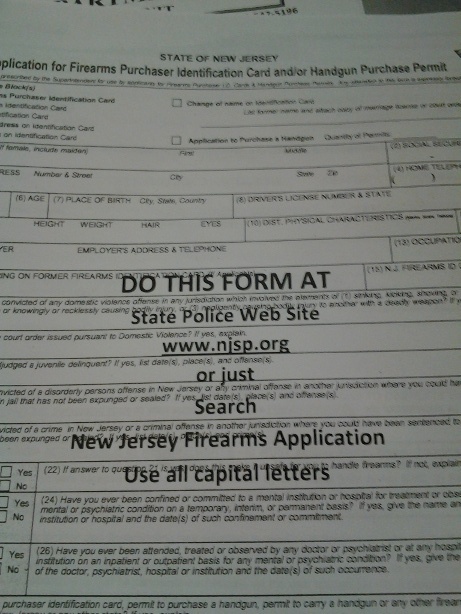 The fees appear to now be roughly $60 (I am expected to pay to have my fingerprints taken and stored) and the included State Application Form is clearly stamped “DO THIS FORM AT State Police Web Site www.njsp.org or just Search New Jersey Firearms Application Use all capital letters”. What is Homeland Security preparing for in Jersey City?